The first church in Ames. 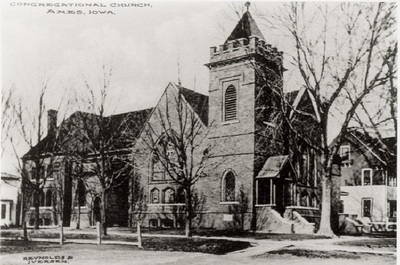 Our first church building, dedicated in 1866. The town of Ames was laid out in late 1864. In the autumn of 1865, eight people met with The Reverend John White to discuss establishing a church in the pioneer community. The group included two Baptists, three Congregationalists, and three Presbyterians. They were H. F. Kingsbury (station agent and postmaster) and his wife Mary, Lyman and Phoebe Pierce (farmers who lived near the village), Robert B. Shearer (carpenter) and his wife Elizabeth, Cynthia Duff, and John Whitlaw. Cynthia and Alexander Duff had purchased land in 1863 and then sold the piece for the original town of Ames to John I. Blair, an engineer who built a railroad across Iowa. Rev. White had recently come from North Woodstock, Connecticut. The Congregationalists and the Presbyterians had a Plan of Union that originated in Connecticut in 1801. The two denominations cooperated in locating new churches on the frontier. By the end of the Civil War, only the spirit of the plan was still in place. 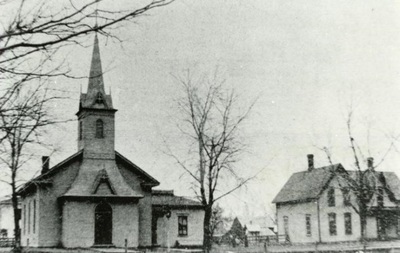 Nevada, to the east of Ames, had established a Presbyterian Church in 1865 and Boone, to the west of Ames, was about to start one. A Congregational church in the middle of Ames fit the plan. On October 15, 1865, the group adopted the resolution: "...We, members of different Evangelical churches, in good and regular standing in humble reliance upon divine grace, and with the sincere desires to promote God's glory, do organize ourselves into a church of the Lord Jesus Christ, to be called the First Congregational Church of Ames, and to be in fellowship with the Orthodox Congregational Churches of the United States." 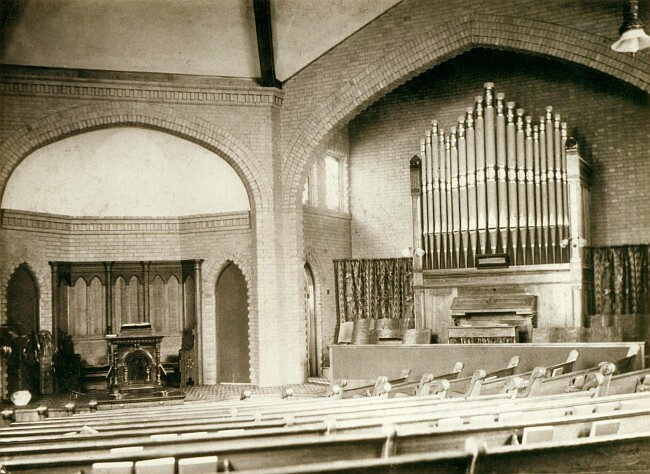 Church services were held in the depot, with a buffalo-skin robe thrown over a packing box for a pulpit and planks laid over nail kegs for seats. Plans were soon underway for a church building. Through the influence of Mrs. Duff, Blair and the Cedar Rapids and Missouri Railroad gave two lots and a $300 contribution. Shearer built a simple wood frame structure. The pulpit was made at the college workshop. A Bible and the first communion set of pewter were gifts from Duff's church in Syracuse, New York. The church was dedicated on October 7, 1866 with Josiah Grinnell, the founder of the town of Grinnell and a Congregational minister, presiding. At the end of the service, Grinnell said he would contact Oakes Ames, a congressman from Massachusetts and namesake of the town, to suggest he send a church bell. Ames sent a bell, cast in Boston in 1866, that still rings in the steeple today. By 1900 the congregation had outgrown the building and a new church was constructed on the same site at Sixth and Kellogg. The building was enlarged in 1930, and the east wing was added in 1958. 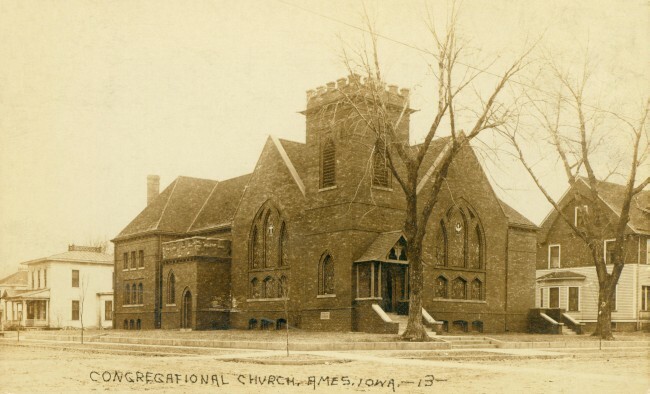 After the 1957 merger of the Evangelical and Reformed Church and the Congregational Christian Churches nationally, the Ames UCC adopted the name United Church of Christ - Congregational, which is still our legal name. In 1963 a campaign was launched to purchase a Kney pipe organ. The congregation voted to raise an additional 25 percent of the cost to finance community outreach projects. The tradition of setting aside a percentage of the operating and capital improvement budgets to support outreach projects continues today. In 2003 the congregation added an elevator in the west side of the church, and financed a Habitat for Humanity home. In 2008 the congregation remodeled the east wing of the church and gave away $88,500 to seven efforts from the Story County Community Dental Clinic to Camundongo Mission Station in Angola, Africa. Ames UCC's current renovations from our 150th Anniversary Capital Campaign include remodeling the youth room, parlor, and sanctuary, and other needed improvements in the building. As part of our outreach giving for this campaign, Ames UCC has contributed to Primary Health Care, the Emergency Residence Project, Food at First, Habitat for Humanity, Project IOWA, Boys & Girls Club of Story County, and Heartland Senior Services, with more gifts to be made as funds come in. From 1865 to 2018 and beyond. For a more in-depth history of Ames United Church of Christ, take a look at the following historical documentation written by Charles Kniker.